the Holiday season approaching and everyone thinking more and more about what they are thankful for it seemed appropriate to share. Sometimes as a parent it’s all too easy to sweat the small stuff. It’s something I try very hard not to do but I admit it has been hard for me lately. Our family is in the midst of a big move. Due to mistakes we’ve made in our financial past coupled with pay cuts and the awful housing market we are giving our home back to the bank and moving to a rental. I have been so stressed out about the move; it’s impact on the kids, our marriage, and our credit score. The logistics of moving and yes, even how it “looks” to our friends, family, and even neighbors. Lately I have been the Olivia Newton John of small stuff. No, my kids don’t get that reference. I am old. Then some things happened to make me snap out of it. The fourteen month old daughter of a friend was diagnosed with Neuroblastoma, a terrible childhood Cancer and just last night the nineteen year old brother of my daughter’s best friend was killed in a car accident on his way home from work, a job he used to share with my daughter. In an instant these families lives went from average to unimaginable. Everything I’m worried about is trivial. My family is whole… healthy, happy, and together. No matter if it’s “ours” or rented, we have a roof over our heads. We have warmth and food. My husband still has his job, which in this economy is saying something. I am keeping these families in my prayers and as I deal with the endless tiny details of day to day life they are never far from my mind. I know right now those parents would give anything to go back to a time when errands and parent teacher conferences were the worry of the day. This Holiday season I’m going to remember to keep my families’ focus where it belongs. What’s important is not decorations, holiday parties, and finding that “hot” toy the kids are after. We’re going to turn down more invitations and spend more time with the people we love. We’re going to do more giving and less taking, adopting a family in our community who is not as fortunate as we are. Every minute of every day I’m going to count my blessings… my five healthy, gorgeous, happy children. The only sweatin’ I plan on doing is at the gym. There is a lot of talk today about the growing popularity of Stay At Home Dads. More and more dads are staying home to care for the kids and run the household. Some do it because the job market caught a massive case of the blahs and lost their job, some want a more defined role in raising their kids. But what about guys like me? We are the Stay At Home Men. In committed relationships, but no kids yet and working from home. We do the cooking, the cleaning and in my case are still the sole breadwinner while my lady is finishing her studies. Now I don’t have to worry about the life of small ones or their development but my day is still crazy and I can’t imagine how parents do it. I wrote before about the blurring of lines and responsibility when you work from home and I wanted to touch base a little more on that. I work a lot, I mean a lot, it’s one of the things Michelle bugs me about most, how I am always zoning off into my laptop hours before the office is open and hours after it closes. When you don’t leave your office it’s hard to shut it off. When you work from home it’s sometimes hard to get motivated until it hits you. We wake up at 5:30am around here which translates to 3:30am at my office. After a large cup of coffee and getting her to the train, I start working most days by 6am. That’s 4am office time and I will run nonstop till 10 or so. Some days I won’t get cracking till 11 but I’ll be working till 7 or 8pm. It’s hard to keep a set schedule, sometimes it’s about being inspired! It’s an advantage and a disadvantage of being at home all the time. The next thing you forget when you work from home is your home duties. When I do have downtime I usually get sucked into doing research for a future project, which when you can do from the comfort of your robe and couch it makes it hard not to use your usual surfing time to get work done. However, I sometimes, and I don’t think Michelle would comment here, forget to do simple 10 minute things like sweep, dust and just do basic upkeep. I am usually good, I do all the cooking, dishes, etc but when I get sucked into a project or get on a roll I can’t pull my head out of office mode. Working from home is a lot like working at a small company. You have to do it all, project manager, cook, maid, dog walker, alien killer, customer service rep and loving partner. It’s tough but I figure if Kevin as our VP is willing to unload boxes from an ocean container before running the kids to practice and going over projects with me I can find time to not completely ignore Michelle and Doogie. How do you find your balance? My son Nolan just started a new sport; Flag Football. He had his first game over the weekend. Well, his first two games. The set up is 11AM practice and then game one at 11:40AM and game two at 12:20PM. Nolan got his first touchdown, which was great. He was super excited. Let me back up a bit; my initial response to yet another time-consuming activity was to complain. I was excited, but a little irritated by the idea of another three-hour weekly commitment. After the first play of game one, everything changed. I love the competition; the sports fever began to boil my blood and run through my veins and it was on. Let’s go all the way, Flag Football Super Bowl – Nolan the MVP! Whoa! I better slow down or I will never get to the point. So, I want to hit on two topics here: kids’ competitive sports & and over-extending our kids. In this post I will discuss the previous issue and post a follow up for the latter. 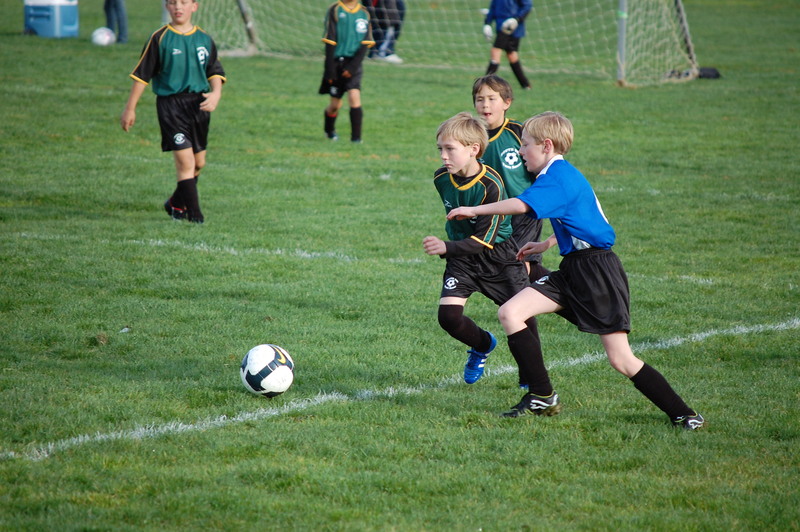 In my original post I discussed the extremes of our attitudes towards kids’ sports. There are the hard-core, ultra-competitive parents and coaches, and then there is the side that does not believe in winning or losing. Yes, I fall in the competitive category, but believe the way we, as parents and coaches, approach how we participate in and coach the sports makes all the difference. Do I want Nolan to be a superstar athlete? Of course I do. What parent wouldn’t? What is more important to me, however, is that he enjoys what he is doing and learns the lessons that team sports offer: teamwork, camaraderie, work ethic, fitness and so on. There are so many valuable lessons kids can learn from sports but a few bad experiences can change it all and discourage kids. That includes parents and coaches that yell and belittle the kids. It is not just the words we use, but our tone can be all that a child hears. I coach Nolan’s soccer team and offered to help the football coach out. I don’t ever want to feel responsible for a child’s bad experience that ends his or her sports enthusiasm. This is at the top of my mind because during one of Nolan’s football games, there was this crazy coach. He yelled at the kids, the ref, and his assistant coach. These are seven and eight year old boys, some playing football for the very first time. Several of the kids on our team made comments that they do not like mean coaches that yell all the time. What are they playing for? The Heisman Trophy/ Super Bowl Ring? I get it; I am very competitive but I think sometimes parents and coaches, from both extremes, need to take a step back and really think about what we are teaching our kids. As a coach and parent, teaching the kids how to play is the easy part. My job is to try and teach each kid about sportsmanship, how to win & lose, how to develop team spirit and work together, just to name a few. At this age, the kids are at different level. They are developing skills, agility, and personal technique, and some are still trying to figure out how turn their second left foot into a right one. Everyone develops at a different rate and I need to teach the team to encourage every individual, regardless of his skill level. One of the hardest ideas to instill is that we win and lose as a team; you know the old adage, “ there is no ‘I’ in team.” Everyone wants to be a star and score but how will anyone score if no one passes the ball? These lessons help kids develop as players, teammates, and human beings. They help prepare them for life. I understand that certain things change with age. Some things may not be appropriate for one age bracket but acceptable for an older group. I am pretty confident, however, that excessive yelling and belittling comments are not conducive to any important lesson. When coached and encouraged properly, kids learn to work together as a team and, I believe, become stronger people on and off the field. So I know Kevin has already touched on the topic of Video games but I want to talk a little bit more. From both the adult and online perspective. I love video games; it is my one dirty vice in an otherwise adult life. My hand eye coordination is off the charts and I have actually had it tested with my reflexes when I was involved in high level sports. True I was a career soccer player but I think most of it comes from Halo. Now are there boundaries with content and children? Of course there are, I would never let my youngest nephews play the games I play. However, when they are old enough to understand the negative societal impact of violence and media, can understand that it’s pretend violence and can appreciate a well placed sniper shot from across the map then I will welcome them with open arms. It is most certainly up to us as adults to keep the right content in the right hands. I own a Wii and I own an xbox360. I know I can let them play pretty much any wii game and not have to worry. However I don’t think I own but one or two xbox games that I would feel comfortable letting them explore. We use the wii mainly for parties when you can get a few adults, a few drinks together and watch the coordination drop and the frustration and mockery rise. Wii play, Wii sports, Wii party anything that pits us against each other is a total blast of good clean harmless fun. But it’s hard to play online with the Wii, it doesn’t offer the same support, game types and of course ability to talk and chat like my xbox 360. This brings me to my next point; keeping in touch. My sister has five kids and I have lived in a different country or state for their entire lives. However; since my oldest nephew got a 360 for his birthday I have talked to them nearly weekly and not just over video games. We watch the same Netflix TV show or movie together and chat, play games with my nephew while talking to the little ones or my nieces through his headset. It has honestly brought us closer. Now mind you I take it easy when he plays with us but I do love to hear him remind my friends that they just got shot in the head by a 5th grader when he manages to take down one of my gamer buddies. It has totally reconnected me with that part of my family. My dad owns an xbox, my brother, my friends back home; I literally owe my continued connection to my childhood friends and my family to my xbox. Lastly of course is the enjoyment and unwinding from my day. I work from home so Like Kevin I never really stop working or wanting to fire up outlook or check in on the FB page. However when I throw my headset on, find people haven’t actually seen in three years online and pickup that controller, it’s like we are all back together again, making fun, having a blast and killing some evil aliens. I want you all to consider this when your kids are of the right age but remember, I played outside nearly every day before I ever came inside to my video games, and my dad and mom always made sure I could handle what I was playing mentally. So if you want to game it up with me, drop me a line and I’ll send my gamertag your way. Remember, Technology is offering new and exciting ways to have fun and stay in touch, but it’s up to you to make sure they are used right and doled out in appropriate portions.